Howard W. Hewitt – Sometimes you just can’t get the bug out of your system. 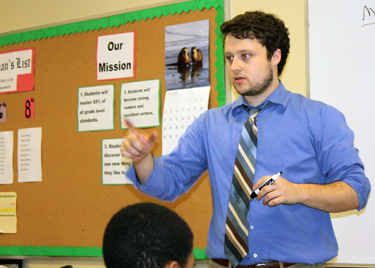 Just last week we heard from Kyle Bender ’12 who is working in Teach for America at Indianapolis. So what does a Wabash man do? Bender volunteered to help create a newsletter for TFA Corps members in Indy. When he got a list of teachers to profiles, he immediately saw the name of Patrick McAlister ’10. So here is Kyle’s story – edited by his former Bachelor Advisor and Public Affairs employer, just like old times. Patrick McAlister has already developed a host of experiences in just three removed from Wabash. He began as a Charlotte 2010 Teach for America Corps Member, but transferred to Indianapolis to complete commitment. He teaches 8th, 9th, and 10th grade ELA at Indiana Math and Science Academy-North, Indianapolis. But McAlister has always liked multiple challenges so last fall he managed Caitlyn Hannon’s campaign for Indianapolis Public School Board. The draw to education first began while he was a Wabash student. Several alums visited campus to reflect upon their time in the classroom as corps members. McAlister was impressed and inspired by their words, particularly how TFA changed their entire perspectives on educational equity. 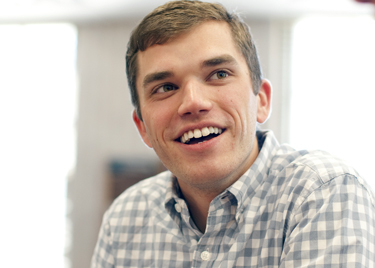 Both joined TFA in 2010 – James assigned to Washington D.C., McAlister to Charlotte. Teaching honors chemistry and physics courses his first year, McAlister’s students posted some of highest gains on the Charlotte district test. However, at the end of his first year, family health issues prompted McAlister to request a transfer closer to his hometown of Fort Wayne. While teaching ELA at IMSA-North, McAlister was also able to utilize another of his passions to support education reform efforts in the city. A veteran of several political campaigns and former press intern for Senator Evan Bayh, McAlister stepped up as campaign manager for his colleague Caitlyn Hannon (Indianapolis 2010) and her bid for IPS School Board. Steve Charles—Last week about this time afternoon classes were cancelled and students were presenting their work at the 13th Annual Celebration of Student Research, Scholarship, and Creative Work. It was our largest ever, with more than 90 presentations. But here’s one that didn’t make the show. It’s about to show up in your mailbox, and much of it is the work of two Wabash students. Senior Ian Grant spent last summer interviewing alumni at the Big Bash Reunion, covering events, and reviewing, scanning, and organizing thousands of historic photos (some not seen for decades) from the old News Bureau Archives. As our first intern for Wabash Magazine, he also served as an editorial assistant for an edition comprising some of those archival photos. And as the internship was a partnership between WM and the Wabash English Department, Ian also meet with Professors Eric Freeze and Marc Hudson and spent at least one hour a day writing his own work, separate from the magazine. The moment he said that, I knew we had chosen not only the right student to be our first intern, but a poet/writer who would become practically a co-editor of this issue of the magazine. His way of seeing connections drove not only his own section of the edition, but our creative approach to presenting these photos and inviting alumni, faculty, students and staff to share their own stories. I hadn’t. The oars had belonged to Wabash President Byron Trippet ’28; he’d brought them home from Oxford in 1934, a gift of his fellow rowers on the Jesus College team. They were hanging in my office because no one else had wanted them. Riley stood there with his mouth open. He didn’t know much about President Trippet, or that he had studied at Oxford and rowed on the same River Isis that Riley had rowed on during his own time there. It didn’t take long to persuade Riley to check out the archives and Trippet’s experience and to write about his own, and Riley connected it with yet another: Wabash Professor of History Steve Morillo had rowed during his time at Oxford as a Rhodes Scholar in the 1980s. “It’s one boat rowing, and I’m just a part of it,” Riley writes in a personal, thoughtful, reflective piece that makes a fitting conclusion to this issue of the magazine. I wish I’d figured out a way to include both Ian’s and Riley’s Wabash Magazine work in last week’s Celebration of Student Research, but I couldn’t even attend. I was in Midland, Michigan doing a press check on the very issue that includes their remarkable efforts, watching it flash by my eyes at the rate of 50,000 impressions per hour as the web press made fast work of months of thought, collection, writing, photography, art direction, layout, and proofing. But I’m proud of this issue of Wabash Magazine because of the way of seeing that these two Wabash seniors bring to us. The connections they made. It’s a very inward-looking edition, asking for stories from alumni, faculty and staff from their own histories and recent pasts. Yet others may wonder at the connections between people here. Researcher and nationally known speaker Brene Brown says that what ultimately gives meaning to our lives is that very sense of being connected. The Wabash community is a petri dish of connections—a place that reveals and inspires them practically every waking moment. That may be our greatest strength, the hidden secret behind so much of what we do well, the sense of being cared about that our students talk about. 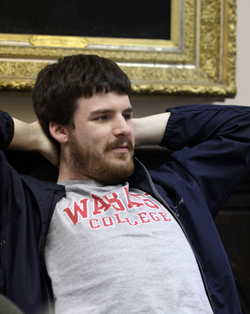 When I think of it that way, watching Ian’s sudden realization last summer of this place he’s a part of, and hearing him say, “I never realized how connected people are here,” was one of the most rewarding and reaffirming moments of my 17 years at Wabash. I hope his way of seeing—and Riley’s—comes through in the edition of Wabash Magazine about to arrive in your mailbox. It’s something to celebrate.